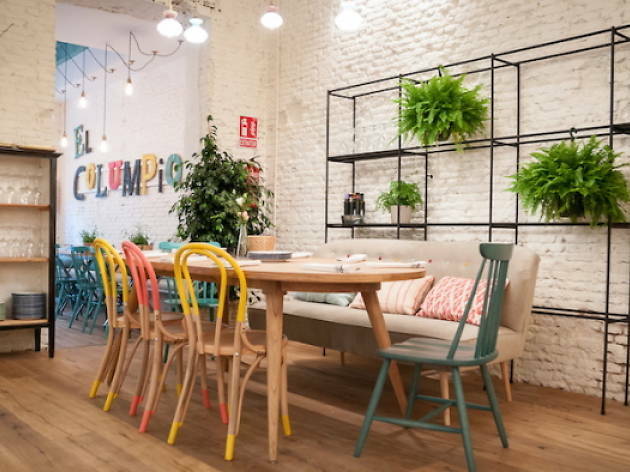 From the team behind Le Cocó, comes this restaurant/bar in the Chamberí neighbourhood. The concept is similar to its older sibling with its rustic-chic décor, long hours and Mediterranean-style dishes. El Columpio features three different areas: a bar where you can drink beer, sip some wines (they've got more than 20 vintages), have a quick breakfast or savour cocktails at the end of the day – in addition to classics such as mojitos, martinis and Bloody Mary, you'll find Aperitz, pisco sour and a recommendable Bellini Sanguíneo, though if you're not sure what you fancy, try the cocktail of the day. In the cosy dining room you'll be in the hands of chef Juan Rioja and his creations, including fresh prawn ravioli, calamari tentacles, veal cheek, suckling pig with pear and wine glaze, black 'butifarra' sausage with greens, king praws and calamari with pasta, among others. There is also a good selection of home-made cakes, and their sweetest speciality, pear soup with red wine and yoghurt. 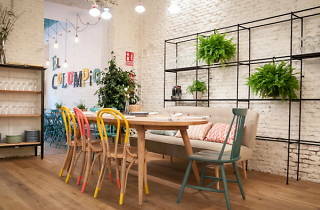 One of El Columpio's big attractions is its chill-out area, a more informal space with tables to share and stools, perfect for disconnecting and relaxing.